The long holiday weekend came at the exact right moment, a time when I desperately needed to recharge and refuel. You see, last week was filled with a lot of battles and struggles and unidentifiable ailments. It was a hard week, to say the least, consuming me with a tankful of mommy guilt for not handling situations well and not being who/what my children needed for whatever reason. But the weekend filled with friends, family, food, exercise and relaxation gave me the opportunity to "punch out" and take a few moments to reevaluate. Now, at the beginning of this short week, I'm feeling better able to tackle unidentifiable ailments. I just wish the gloomy, rainy weather got the memo. Our holiday weekend was spent with friends and family. Friday night was dedicated to our good friend Chris, who turned another year older. Sunday we had friends over for our annual Memorial Day BBQ. 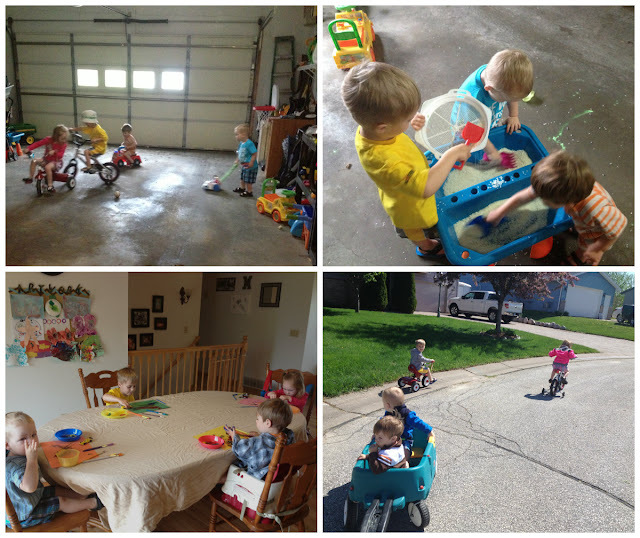 Our kids are finally at an age where we aren't constantly refereeing disagreements and are able to squeeze in longer moments of adult time. I think we're outgrowing our kids' table. 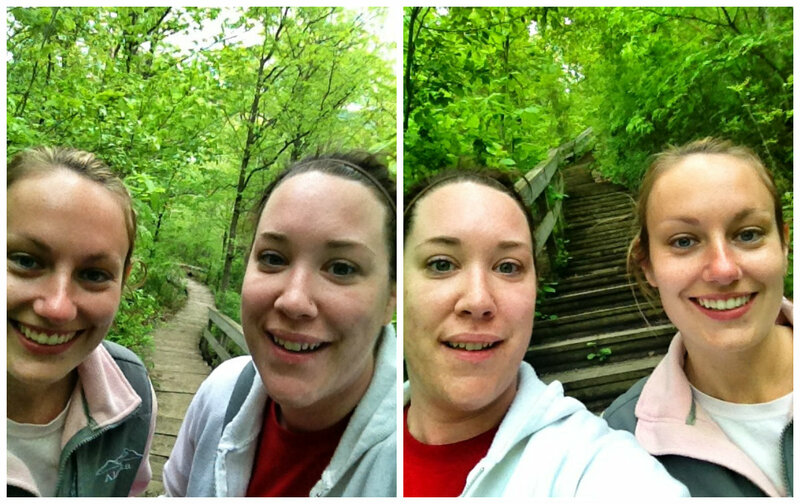 Monday while my boys were at a service honoring the fine men and women who served our country, my friend Ann and I took on a monumental battle -- 600+ stairs. 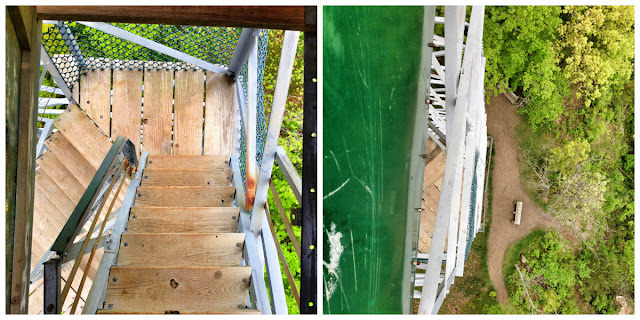 These wooden stairs are encased between beautiful green scenery, and you almost forget that your legs are burning and you're wheezing as your lungs beg for air. Almost. And when you reach the top, you're rewarded by the view of green and blue for miles. 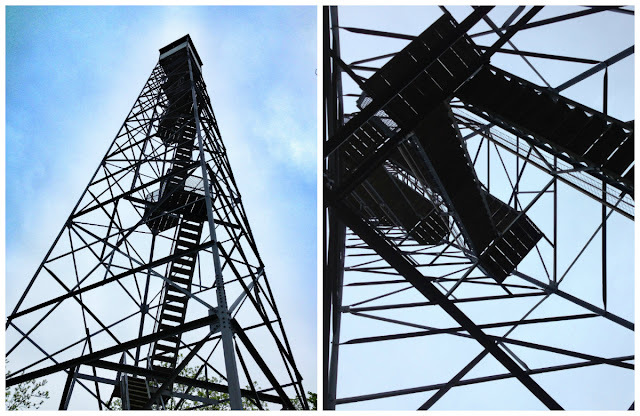 The actual destination of all those stairs is an old fire tower, standing proud atop the hill. This tower is deceptively tall, and as you're winding your way up the wobbly stairs that feel as though you're swaying in the breeze, more and more layers of staircases reveal themselves. I battled a new found fear of heights as I followed Ann up the tower, my hands gripping the railings lest I miss a step and tumble down. Once we stood atop the platform on the top overlooking the land below us, my fear dissipated and I simply took in the beauty of it all. But then, of course, we had to descend the windy staircase and all those 600+ wooden stairs that lead us up to this place. left: the ones we already climbed. right: the ones left to go. Reveling in the fact that we did it! Thank you to all the men and woman who have fought for our freedoms--the true meaning of our holiday weekend. We are very thankful that the soldier in our lives is still walking with us today, instead of being memorialized on such a bittersweet day. Instead, we honor Dave's service by visiting the brick dedicated to his time served that is located in Veteran's Memorial park. Friday I watched my friend's kids, which is always fun and exhausting at the same time. It was almost easier when the youngest two kids were still babies, even if I simultaneously nursed one while bottle fed the other. It was simpler when there were only two that I had to referee and the bickering and sharing issues were only doubled, not quadrupled. But all of that is worth it at the end of the day when two year old B-man runs up to me, unprompted, and throws his little arms around me for a quick hug. Although we may not share any of the same blood, these kids are still my family. 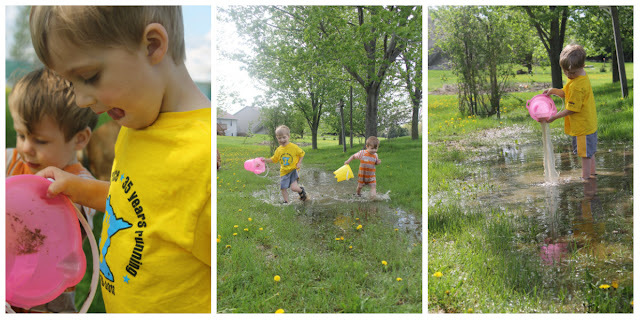 Since the snow melted and the rain eagerly replaced it, there has been a constant stream in my backyard, making the most delicious swamp playground for my boys. Finally I succumbed to their pleading and indulged their desires to splash and stomp around in the massive puddle. And it made for a fun photo-op. A Walk Along the Mississippi. As we waited for Daddy to get off work one day and meet us for supper, we wasted time by visiting the levy along the Mississippi river. A giant at the little table.